In the winter of 1937, a young Russian woman named Eugenia Ginzburg was falsely accused of revolutionary activities and sent to a labor camp for the next 18 years. During the 1930s, after Joseph Stalin assumed control of the Soviet Union, millions of Soviet citizens like Ginzburg were imprisoned in labor camps known by the acronym GULAG. At the height of the Stalinist purges, Russians were sent to the gulag for crimes as petty as making jokes about Stalin. The camps were infamous for their harsh treatment of prisoners and millions died before finishing their sentences. Eugenia Ginzburg spent almost two decades in Kolyma , a remote wilderness in northwestern Russia on the Sea of Okhotsk . Prisoners in Kolyma endured subzero winter temperatures and principally labored in gold, tin, and uranium mines. The Kolyma camps were some of the most brutal in the entire gulag system. An estimated three million prisoners are estimated to have died in Kolyma alone. Prisoners sent to Kolyma were first packed into cars on the Trans-Siberian Railroad and sent across Russia by train to the city of Vladivostok on the Sea of Japan. From Vladivostok, inmates were transferred to ships that traveled north to Magadan , a port city on the Sea of Okhotsk that served as the gateway to Kolyma. On the sea journey, prisoners were often tortured and hosed with freezing water. Thousands died before they even reached Kolyma. Polish writer Ryszard KapuÅciÅski called Kolyma, “the most terrible—next to Auschwitz—place on earth.” Prisoners in Kolyma completed workdays that could last 14 hours and were fed meager rations. Guards routinely shot those who tried to escape. Despite the hardships, prisoners in Kolyma mined nearly half of the world’s gold produced at the time and built a 1,900 kilometer road between Magadan and the city of Yakutsk that became known as the “Road of Bones” because so many prisoners died during its construction. The merciless conditions in the gulag largely remained a secret during Stalin’s reign. Gulag prisoners who made it home alive and wrote about their experiences were censored from publishing their accounts in the Soviet Union. In 1944, U.S. vice president Henry Wallace traveled to Kolyma while on a tour of Asia, but local authorities hid prisoners and dismantled evidence of the camps during his visit. The vice president wrote a book about his trip and praised the impressive industry he saw in Russia’s Far East. Years later, when the cruelty of the gulags became widely known, Wallace apologized for misinforming the American public about the reality in Kolyma. Unlike most prisoners, Eugenia Ginzburg survived to tell the tale of her imprisonment. Ginzburg wrote two memoirs about her experience in the gulags entitled, Journey into the Whirlwind which tells of her trip to Kolyma, and Within the Whirlwind about her prison sentence. Ginzburg’s books were later published abroad and provided readers outside Russia with great insight into the tragic reality of life in the gulag. Varlam Shalamov , a journalist and poet, also survived 17 years in the gold-mining camps of Kolyma. Shalamov was first sent to Kolyma for a five year sentence, but his time at the camp was increased by another decade for calling novelist Ivan Bunin , the first Russian writer to win the Nobel Prize for Literature, a “classic Russian writer.” After his release from the gulag, Shalamov wrote prolifically about life in the camps and is best known for his book, Kolyma Tales , a collection of short stories about the gulag. Kolyma Tales was first published abroad and a Russian version of the book was not printed until 1989—seven years after Shalamov died. Although Magadan was built because of the gulag, the era of labor camps has faded into the past. Today, tourists can visit Magadan and explore the wilds of Kolyma. Those interested in gulag history can choose from several tours that include visits to former labor camps. Moscow-based Otkrytie Travels runs an eight-day trip to Magadan called the Kolyma Golden Ring tour that traverses 1,300 kilometers through the Russian Far East. The trip includes a tour of Magadan and a visit to the Dneprovsky mine where gulag prisoners once dug for tin with little more than a pickaxe and shovel. This all-inclusive tour starts at $4,300 and includes accommodation, meals, transport, and an English-speaking guide. 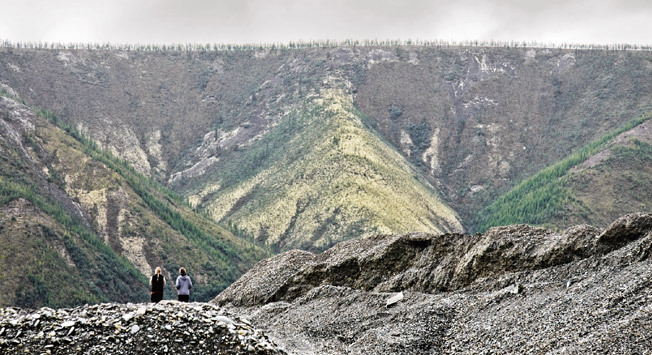 DVS-TOUR in Magadan offers several historical tours to gulag sites in Kolyma, including the Dneprovsky mine and Butugychag, a former tin and uranium mine in Kolyma. Butugychag is one of the most remote gulag sites in Kolyma and the trip there takes five days on rough roads from Magadan. Once in Butugychag, visitors spend a night at the mine sleeping in tents and an entire day touring the former camp. The tour provides one of the most intimate looks at this dark chapter of Soviet history and takes travelers on a stunning drive through the Kolyma wilderness. DVS-TOUR also runs numerous fishing, hunting, river rafting, and other outdoor adventure trips in Kolyma that can easily be combined with a gulag tour. Contact DVS-TOUR to create a personalized trip and inquire about prices. From its base in China, Koryo Tours organizes a trip each summer called the Abandoned Russia Tour . The tour begins in Magadan and continues along the Road of Bones all the way to the city of Yakutsk. During the trip, travelers have the opportunity to stop at gulag sites, former mines, and the ghost town of Kadykchan which was abandoned nearly two decades ago after an extremely cold winter forced the last-remaining residents to leave. This journey through Kolyma along a road constructed by gulag prisoners includes transport, accommodation, food, and English-speaking guides. Koryo Tours runs this popular trip each summer. The tour starts at $6,000 per person and can fill up well in advance, so it’s advisable to book ahead. To apply for a spot on the tour, write to simon@koryogroup.com .